It was Sweden’s National Day on Wednesday (June 6th). For some reasons that I know but do not fully understand, our offices were open on that day. However, I decided to take a day off. Not specifically because it is Sweden’s National Day but because I wanted to volunteer at the Make Musik Sthlm festival. This music festival is based on “la fête de la musique” born in France some 30 years ago. 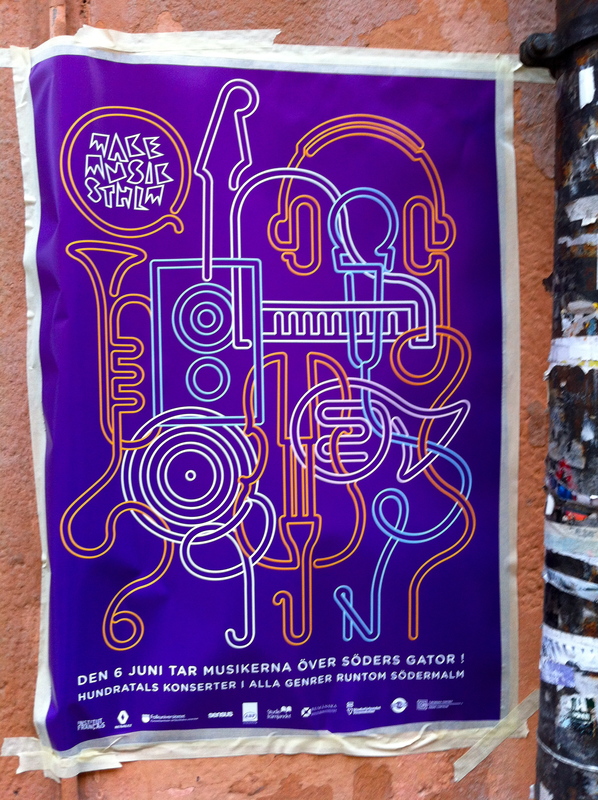 This is only the 2nd edition of Make Musik Sthlm and this year, my good friend LSG is in charge. 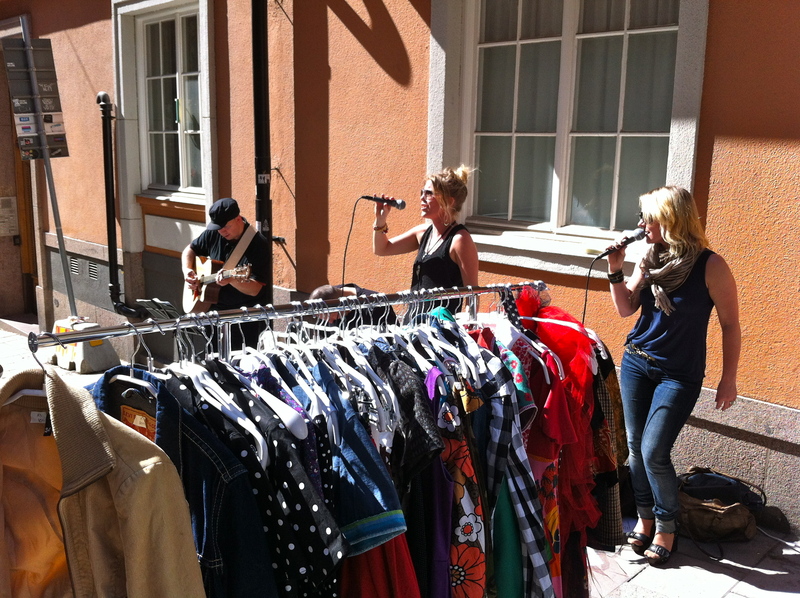 She is the festival coordinator and she managed to put together some 300 free concerts everywhere on Södermalm. LSG is working with a small team of people who have been working around the clock to make this happen. So I should have l known better when I woke up that morning and found a message from my zone coordinator asking that we meet at 8. We had always agreed to meet at 9. It was a typo of course but I am a nerd. Always been, always will be. So when she did not answer my email that morning I headed out to Södemalmstorg at 8. I got the reply at 8:10. That was a typo. I was already out so it was a perfect excuse to go for coffee. Except, this is Sweden’s National Day and everything is closed at 8 am. So I decided to check out the places where I would be working during the day. And naturally I ended up at Mosebacketorg. I have been here many times. 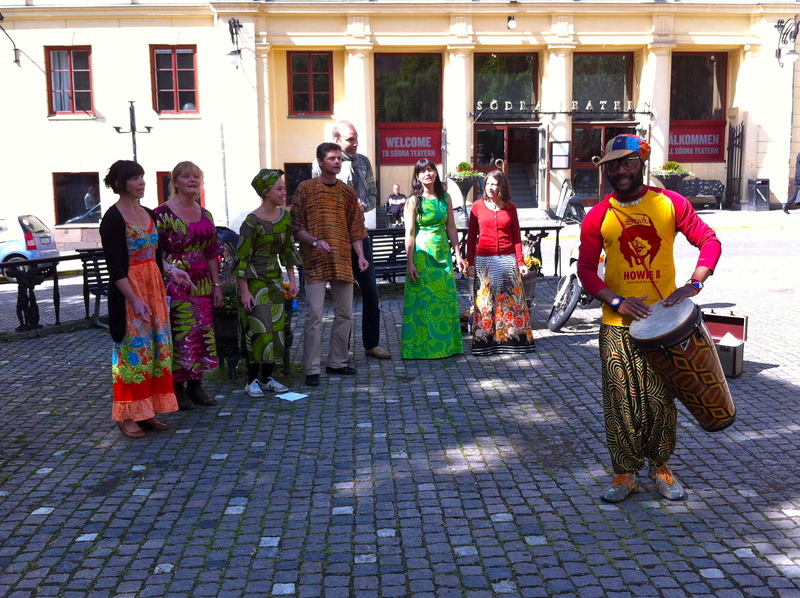 The square is right in front of Södra Teatern. 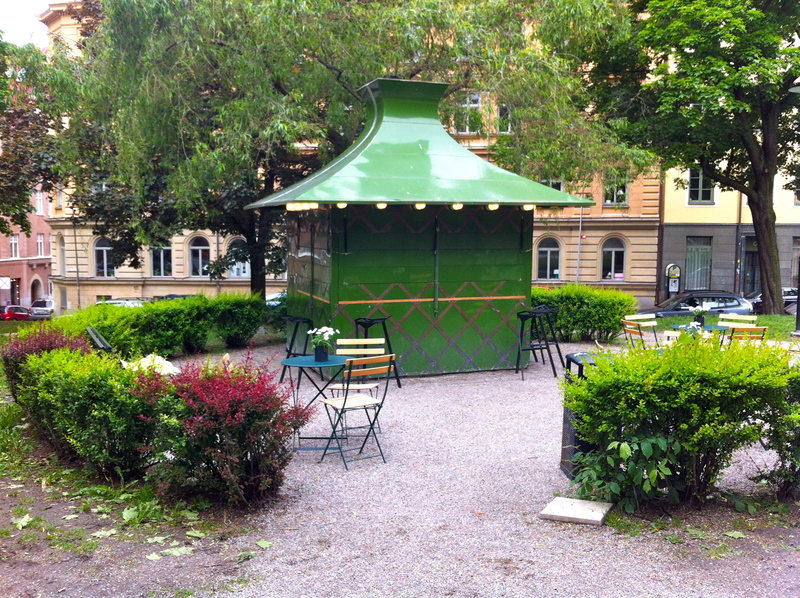 This is also where I spent my first Sunday afternoon in Stockholm in August 2011, in the beer garden behind Södra. There is also a small coffee kiosk in the square. Of course it was closed at 8 am but as I was about to leave the peacefulness of the square and its nice fountain, I noticed a cute girl opening up the kiosk. This is not the usual type of cafe covered in this blog. However, the square, the day with the music festival on its way, and everything around the square reminded me that this was one of the best spots in Södermalm. I did not have high expectations for the coffee, but I knew that the overall experience would be great. Unfortunately, despite the kiosk being quite small, it took more time than I expected to open up the place. And since I am a nerd, I did not want to be late for my 9:00 meeting so I had to leave Mosebacketorg at 8:55, before I had the chance to get a coffee. I wasn’t too worried because I knew I’d be back here later in the afternoon for Bolingo’s gig. I had already planned to arrive a bit early and enjoy a coffee in the park. Until then, I would go and be part of the Make Musik Sthlm magic. After seing a few bands, including some gospel from Calvary Chapel at Södermalmstorg, Billie Qwen at Poplin, Kristal and Jonny boy at Debaser Slussen, Lisah at Poplin and Debaser, and Cattis Bergqvist on Götgatan, it was time to get back to Mosebacketorg for Bolingo. This band is led by Ladi, originally from the Democratic Republic of Congo, and include some 10 Swedes who simply love the Congolese music. There was a good crowd for Bolingo, with everyone in the square dancing. When I arrived at Mosebacketorg some 30 minutes before Bolingo’s gig, the “café” was open and all tables in the sun were taken. Since I had been running in the sun all day (I could already feel the sunburn on my face), I was quite happy to sit at the “counter” and watch the girls in the kiosk interact with the customers. I had an espresso with a cookie that provided the much needed sugar for the rest of the day. Frankly, I am unlikely to drink coffee at that kiosk very often. It’s not because the coffee wasn’t good. The thing is, right next to Mosebacketorg is Södra Teatern with its beautiful beer garden. 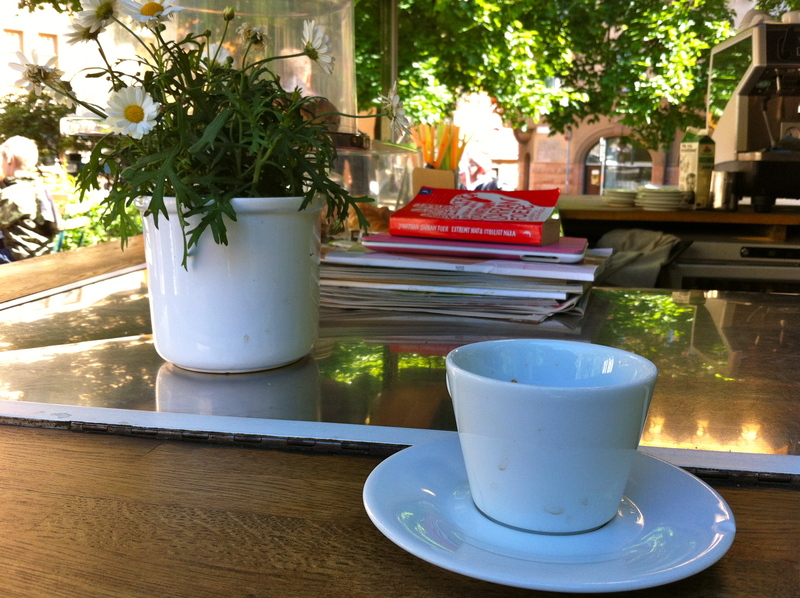 And when it is nice enough to have a coffee at Mosebacketorg, it is even nicer to have a beer in the garden 😉 On the day of Make Musik Sthlm, I knew that there would eventually be an after party and an after-after party so it made sense to have coffee in the afternoon rather than a beer! Judging by how I feel today, I am glad I had a coffee at that time…. more than enough beer followed in the evening! 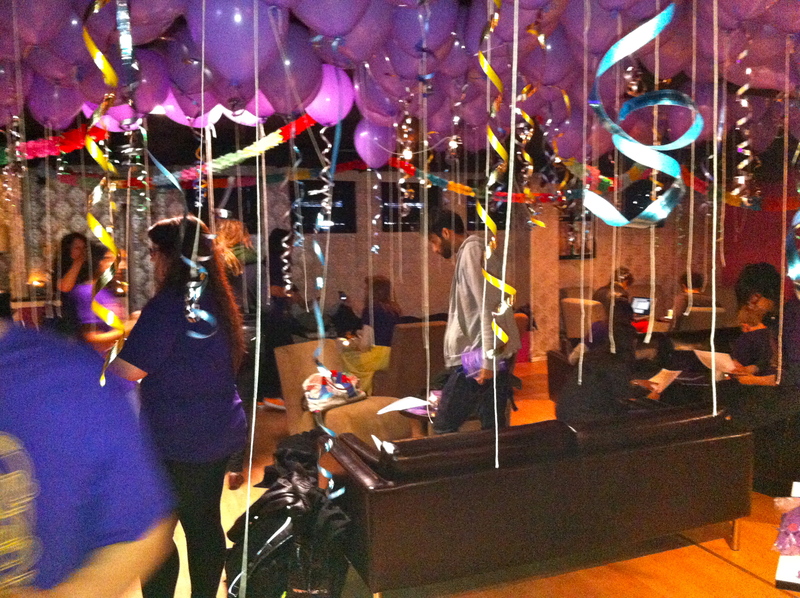 LSG and her team did an amazing job. 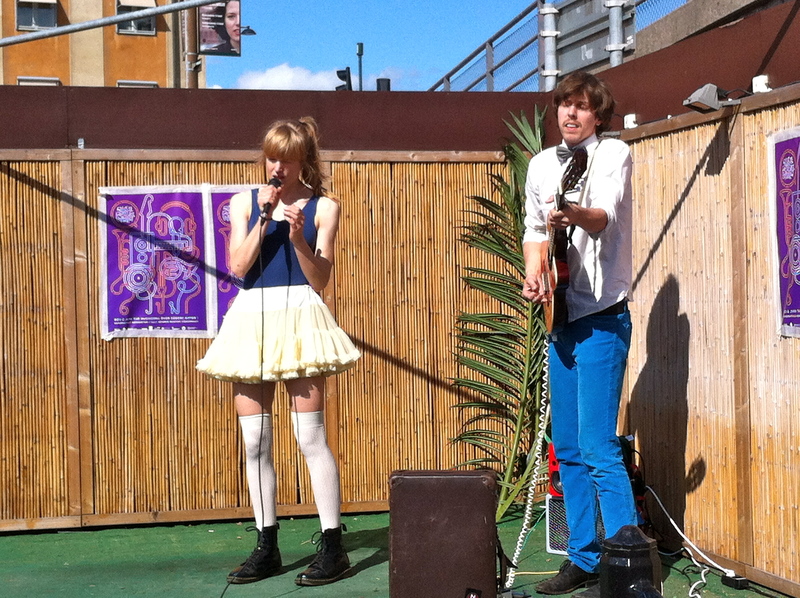 Make Musik Sthlm was a huge success, and the parties that followed were just as great. Of course, I was by far the oldest volunteer on that day. But it was a great experience and I certainly am ready to sign up for next year if LSG is involved again. Until then, there will be plenty of occasions to enjoy music in Sweden, including with the Stockholm Music and Arts Festival, Way Out West in Göteborg and Popaganda! This entry was posted in Coffee, Music. Bookmark the permalink. Next year we should try to have Lebanese music at the festival! Whhha? I thought the Sweedes were all about Welfare State!!! Also.. how was the afterparty?! It is all about Welfare State believe me… but they are not overly excited about their national day. Dang! You’re keeping me from all the fun!! I think it’s entirely unpatriotic for offices to be open on national holidays…but I’ll admit that’s because I’ll take any day off I can get when I’m working!